Fun Bee Facts for Kids! There are so many interesting facts about this busy little insect! 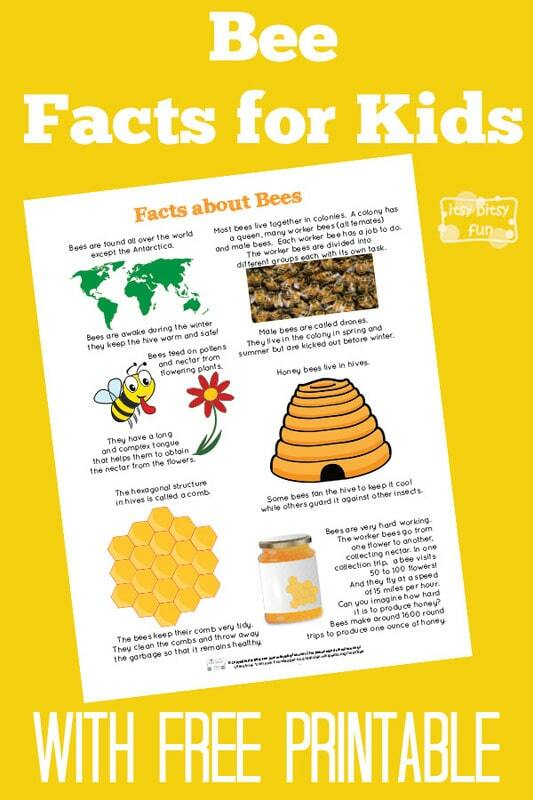 Let’s learn with facts about bees for kids! Buzz…buzz….. See that small insect flying past your ear? It’s very busy as it is looking for nectar. You like honey on your toast? Honey is made by bees. Let’s learn more about bees today and how they help us. Hope you’ll enjoy reading through these fun facts for kids and that you and your kids will learn many new things! Bees are found all over the world except the Antarctica. Bees feed on pollens and nectar from flowering plants. Do you know there are more than 20,000 species of bees? They have a long and complex tongue that helps them to obtain the nectar from the flowers. Most bees live together in colonies. A colony has a queen, many worker bees (all females) and male bees. Each worker bee has a job to do. The worker bees are divided into different groups each with its own task. Male bees are called drones. They live in the colony in spring and summer but are kicked out before winter. The hexagonal structure in hives is called a comb. Some worker bees produce the wax which is used to build the combs. Bees mix little bit of honey with the pollens and pack them into the cells so that the young ones can feed on them. Bees are awake during the winter – they keep the hive warm and safe! Some bees fan the hive to keep it cool while others guard it against other insects. The bees keep their comb very tidy. They clean the combs and throw away the garbage so that it remains healthy. The queen bee lays the eggs in cells of the comb. Larvae are hatched from the eggs in three to four days. The worker bees get food for the larvae. It takes 21 days for an egg to develop into an adult bee. Do you know what a brood is? A group of young bees is called the brood. You must have heard the term busy as a bee. Bees are very hard working. The worker bees go from one flower to another, collecting nectar. In one collection trip, a bee visits 50 to 100 flowers! And they fly at a speed of 15 miles per hour. Can you imagine how hard it is to produce honey? Bees make around 1600 round trips to produce one ounce of honey. Bees are man’s best friend as they provide us with honey and also help in pollination. So, next time you see a bee, don’t get afraid. Thank it for the honey it gives you. Reading the bee facts for kids is one thing (and it can be sufficient if your kid is a reading type) but visualizing things can be even better. 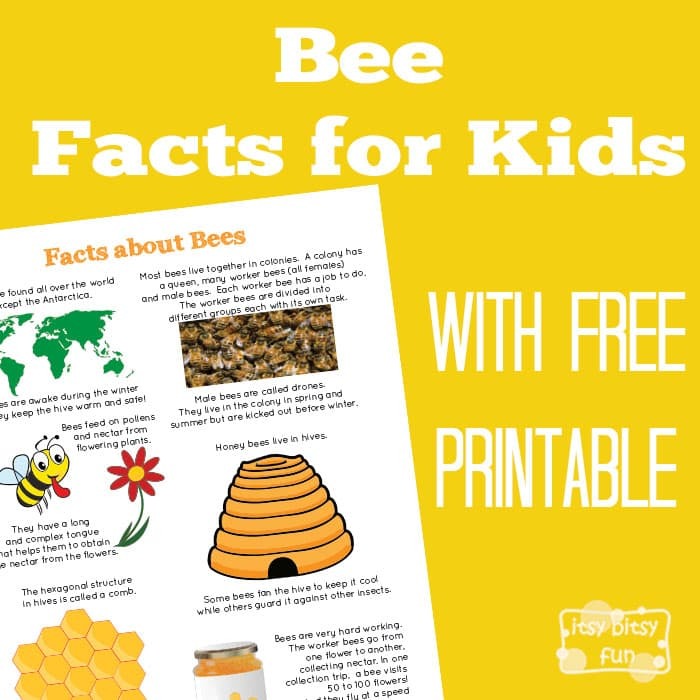 Get your free printable Fun Bee facts for Kids here.